“Cost” here is mainly a function of how often Trump is hoping to eat in the Senate’s invitation–only dining room. Otherwise what’s “baffling” is how long it took the notoriously impatient Trump to sound off. Trump’s marriage of convenience with “legislative mastermind” Mitch McConnell — Curator of the Senate — has produced less than his relationship with Vladimir Putin. Currently Trump has achieved the unthinkable: Bi–partisan cooperation in Congress. Republicans are blocking what Trump wants to do and Democrats are blocking what Trump wants to do. On July 27th Trump criticizes McConnell for failure to repeal Obamacare. On August 8th Trump reverses course and endorses McConnell’s candidate, Luther Strange, in the Alabama special election. 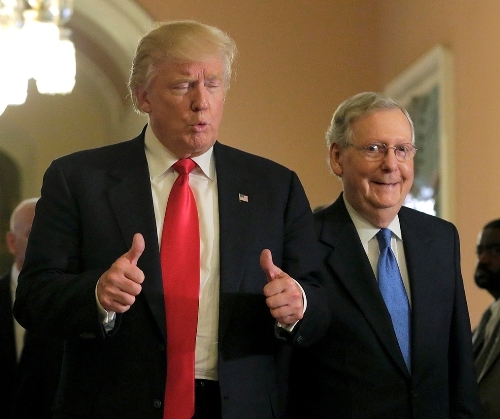 On August 10th Trump lurches back into drive and says McConnell should resign from Senate leadership. On August 15th Trump repeats his strange endorsement of Strange. That must change. Trump needs to play his “long game” and make opponents pay a price. Trump held a rally in Arizona last week, the home of craven media hound Jeff Flake who is conveniently up for re–election in 2018. The Strange endorsement proves Trump’s White House political operation is either second–rate or angling for jobs with the establishment GOP after Trump leaves. Trump is also notoriously cheap, as his reneging on his pledge to fund his own campaign proved, so funding a PAC to support primary challengers is unlikely. Finally, Trump has the attention span of a short circuit. I’m afraid instead of reforming a political system run solely for the benefit of the elites; Trump will wind up being George Bush with an angry Twitter account. Forced to accept whatever crumbs and statist legislation McConnell and Speaker Paul Rino, excuse me, Ryan send him.